Internationnal customers price is € 699.17. 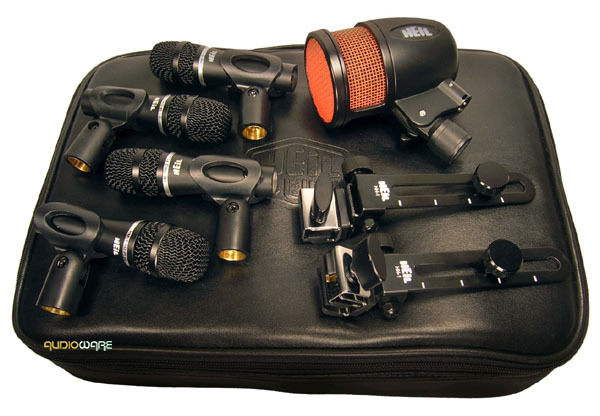 The Heil HDK-5 Drum Microphone Kit features 4 Handi Mic Pro Plus mics for miking up your drum set, a special PR 48 mic just for the kick drum, as well as two HH-1 mounts for tom-mounting, 4 HM mic clips for attaching to a mic stand, and a convenient black carrying case to protect them between use. The Heil HDK drum mic set series is a culmination of over 2 years spent on the road with leading drummers. They gave Heil their ideas, dreams, and needs which Heil then turned into reality. Every component of a drum kit needs special attention when it comes to reproducing the sound accurately. There are many drum microphones out there, but the artists that helped design the Heil drum microphones wanted more accuracy, not just level. Each one of them were tired of little plastic toys that did not reproduce well. They all agreed, after hearing and using the technologies of the Heil drum microphones, that they had never heard this level of quality reproduction. The Heil Handi Mic Pro Plus is a dynamic microphone that incorporates innovative mic technology designed for a wide range of professional applications. This versatile Heil microphone excels at live sound, commercial broadcast, and sophisticated recording venues. The Handi Mic's wide frequency range outperforms tired, 30+ year old industry technology and can withstand huge amounts of SPL. The end result is a microphone that can answer the call to any application. The Handi Mic Pro Plus is ideal for use with tom drums where smaller microphones are needed, as well as inside Leslie speakers. The Handi Mic is perfect as an interview microphone because of its small size, low profile, and great sound. Since 1982, Heil Sound has been the leading manufacturer of communications microphones and has a paramount understanding of phasing. When properly applied, this knowledge creates outstanding cardioid patterns with unbelievable rear rejection that removes unwanted sounds that try to enter from the off axis rear. The pattern control of the Heil Handi Mic Pro Plus is outstanding. This exceptional performance is achieved by using the ideal combination of materials for the large low mass diaphragm and a special mixture of neodymium, iron, and boron that gives the Handi Mic Pro Plus Microphone the strongest magnet structure available. Heil technicians paid special attention to the microphone's phasing plug assembly. The Handi Mic's equally placed ports accept sound from behind out of phase. Thus, the Handi Mic Pro Plus produces a very linear cardioid pattern and reduces proximity effect while achieving perfect articulation. The Heil element in this microphone is usable at extreme high sound pressure levels and is immune to overload conditions. That makes the Heil Handi Mic Pro Plus a dynamic microphone that is perfect for vocal and live sound applications. The Heil PR 48 kick drum microphone starts with Heil's 1.5" large diaphragm dynamic element sealed in a vulcanized shock mount and fed with a specially designed low-pass filter that creates a 10dB rise from 60Hz to 100Hz — right where the kick drum resonates. It stays out to 7.5 kHz and drops off drastically to eliminate any unwanted internal sounds. The total frequency response is 30Hz - 8.5kHz (4dB rise @ 4500Hz). Its rear rejection is -40dB @ 180° off-axis. It can handle +148dB SPL. The PR 48 metal housing was designed with a slanted entrance to the 3-pin XLR so the cable assembly is easier to connect. The microphone provides a 600 ohm balanced output. Handi Mic Pro Plus Frequency response: 80Hz - 15kHz Polar pattern: cardioid Impedance: 600 Ohm balanced Output level: -55dB End fire generating element: .75" diameter dynamic Polarity: pin 2+ Magnet structure: neodymium Case structure: zinc alloy Length: 4.50" Diameter: 1.31" Stem diameter: 3/4" Weight: 7oz.